Checking accounts designed with you in mind. Whether you have limited banking needs, searching for an account with additional privileges and discounts or simply appreciate the familiarity of the regular checking account, our customer service representatives can identify the features that matter the most to you. Proud to be a part of the Corsicana & Mildred communities. Allow us to invest in you and the youngest members of our community. For each new checking account opened at the Corsicana branch location through April 30, 2019, $25* will be deposited in your new account and First State Bank will donate $25 to either the Corsicana ISD Education Foundation or the Mildred ISD Education Foundation. *$50 minimum deposit to open an account. 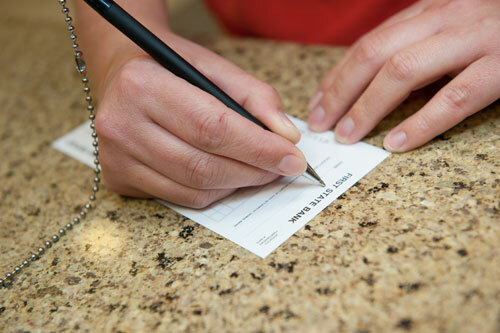 The First State Bank checking account must remain open for at least 6 months from the date of the first deposit or $25 will be deducted from the account at closing. A FREE program that rewards you for using your debit card. Consider it our little "Thank You" for being a loyal customer. It's easy! We'll give you points for simply using your First State Bank Debit Card to purchase merchandise or services. Then, redeem your points and receive great gifts and merchandise. E-Statements give you fast, safe access to your statements including images of checks you've written and you can view, print or save them anytime you like. The many benefits of E-Statements can be yours in a few simple steps. Log in to Online Banking, Click on E-Statements, Select the accounts you want to include, Verify email address where notification will be sent, Read and sign the Electronic Statement Disclosure, Check box next to terms and conditions, enter the confirmation code & Accept. (1): $8 service charge if balance falls below $1,000 at any time within the month. The $8.00 service charge is waived on senior accounts on the month following notification by the customer to the bank that they have reached the age of 62 years or older. ** Paper Statements without images available for $3 per month.